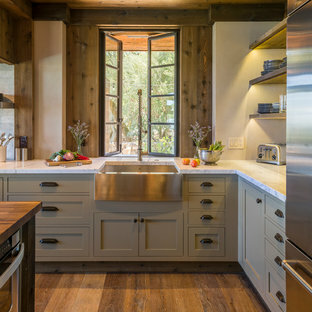 Scopri su Houzz la più vasta collezione di foto e idee per: Legno e pietra. Sfoglia 271.704 foto sul tema e lasciati ispirare per il tuo prossimo progetto. 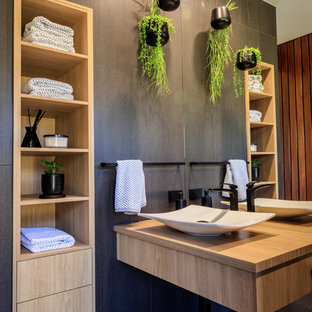 Christine Hill Photography Clever custom storage and vanity means everything is close at hand in this modern bathroom. 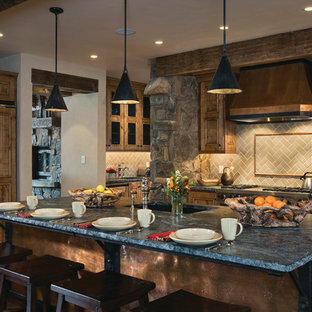 Di Denali Custom Homes, Inc. Designed as a prominent display of Architecture, Elk Ridge Lodge stands firmly upon a ridge high atop the Spanish Peaks Club in Big Sky, Montana. Designed around a number of principles; sense of presence, quality of detail, and durability, the monumental home serves as a Montana Legacy home for the family. Throughout the design process, the height of the home to its relationship on the ridge it sits, was recognized the as one of the design challenges. Techniques such as terracing roof lines, stretching horizontal stone patios out and strategically placed landscaping; all were used to help tuck the mass into its setting. Earthy colored and rustic exterior materials were chosen to offer a western lodge like architectural aesthetic. Dry stack parkitecture stone bases that gradually decrease in scale as they rise up portray a firm foundation for the home to sit on. Historic wood planking with sanded chink joints, horizontal siding with exposed vertical studs on the exterior, and metal accents comprise the remainder of the structures skin. 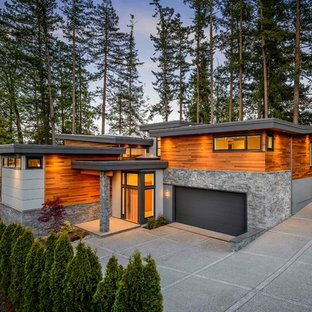 Wood timbers, outriggers and cedar logs work together to create diversity and focal points throughout the exterior elevations. Windows and doors were discussed in depth about type, species and texture and ultimately all wood, wire brushed cedar windows were the final selection to enhance the "elegant ranch" feel. A number of exterior decks and patios increase the connectivity of the interior to the exterior and take full advantage of the views that virtually surround this home. Upon entering the home you are encased by massive stone piers and angled cedar columns on either side that support an overhead rail bridge spanning the width of the great room, all framing the spectacular view to the Spanish Peaks Mountain Range in the distance. The layout of the home is an open concept with the Kitchen, Great Room, Den, and key circulation paths, as well as certain elements of the upper level open to the spaces below. The kitchen was designed to serve as an extension of the great room, constantly connecting users of both spaces, while the Dining room is still adjacent, it was preferred as a more dedicated space for more formal family meals. There are numerous detailed elements throughout the interior of the home such as the "rail" bridge ornamented with heavy peened black steel, wire brushed wood to match the windows and doors, and cannon ball newel post caps. Crossing the bridge offers a unique perspective of the Great Room with the massive cedar log columns, the truss work overhead bound by steel straps, and the large windows facing towards the Spanish Peaks. 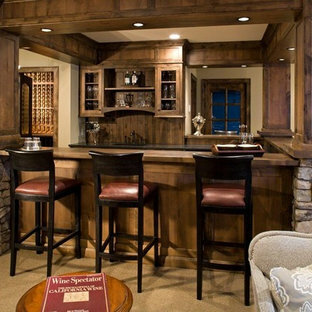 As you experience the spaces you will recognize massive timbers crowning the ceilings with wood planking or plaster between, Roman groin vaults, massive stones and fireboxes creating distinct center pieces for certain rooms, and clerestory windows that aid with natural lighting and create exciting movement throughout the space with light and shadow. A durable, meaningful design heals a devastated residential property bordering Acadia National Park and Somes Sound on Maine’s Mount Desert Island. Comprehensive stormwater management strategies shape new landforms, resulting in elegant grading and thoughtful drainage solutions. Native plant colonies stabilize the site, regenerate habitat, and reveal wildlife patterns. Exquisitely crafted new masonry, built from an authentic palette of local reclaimed materials, gives the garden a unified, established feel. 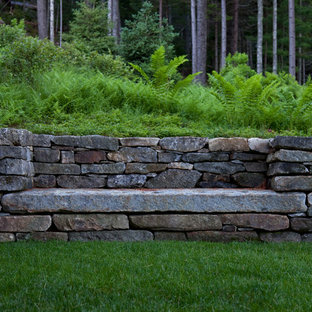 Lichen-encrusted stone retaining walls define edges, thresholds, and overlooks, and thick slabs of salvaged granite embedded in the earth provide gathering terraces and pathways. With balance restored, brilliant seasonal drama unfolds. Like us on facebook at www.facebook.com/centresky Designed as a prominent display of Architecture, Elk Ridge Lodge stands firmly upon a ridge high atop the Spanish Peaks Club in Big Sky, Montana. Designed around a number of principles; sense of presence, quality of detail, and durability, the monumental home serves as a Montana Legacy home for the family. Throughout the design process, the height of the home to its relationship on the ridge it sits, was recognized the as one of the design challenges. Techniques such as terracing roof lines, stretching horizontal stone patios out and strategically placed landscaping; all were used to help tuck the mass into its setting. Earthy colored and rustic exterior materials were chosen to offer a western lodge like architectural aesthetic. Dry stack parkitecture stone bases that gradually decrease in scale as they rise up portray a firm foundation for the home to sit on. Historic wood planking with sanded chink joints, horizontal siding with exposed vertical studs on the exterior, and metal accents comprise the remainder of the structures skin. Wood timbers, outriggers and cedar logs work together to create diversity and focal points throughout the exterior elevations. Windows and doors were discussed in depth about type, species and texture and ultimately all wood, wire brushed cedar windows were the final selection to enhance the "elegant ranch" feel. A number of exterior decks and patios increase the connectivity of the interior to the exterior and take full advantage of the views that virtually surround this home. Upon entering the home you are encased by massive stone piers and angled cedar columns on either side that support an overhead rail bridge spanning the width of the great room, all framing the spectacular view to the Spanish Peaks Mountain Range in the distance. The layout of the home is an open concept with the Kitchen, Great Room, Den, and key circulation paths, as well as certain elements of the upper level open to the spaces below. The kitchen was designed to serve as an extension of the great room, constantly connecting users of both spaces, while the Dining room is still adjacent, it was preferred as a more dedicated space for more formal family meals. There are numerous detailed elements throughout the interior of the home such as the "rail" bridge ornamented with heavy peened black steel, wire brushed wood to match the windows and doors, and cannon ball newel post caps. Crossing the bridge offers a unique perspective of the Great Room with the massive cedar log columns, the truss work overhead bound by steel straps, and the large windows facing towards the Spanish Peaks. As you experience the spaces you will recognize massive timbers crowning the ceilings with wood planking or plaster between, Roman groin vaults, massive stones and fireboxes creating distinct center pieces for certain rooms, and clerestory windows that aid with natural lighting and create exciting movement throughout the space with light and shadow. The floor has stone slabs in the middle, which is hard and durable, great for an entrance. The stone is edged with the same oak planks that flow through the rest of the house. The walls are painted in Sure Grey from the Damo collection, available at Sigmar. The woodwork is Cocoa, also from Damo. This modern lake house is located in the foothills of the Blue Ridge Mountains. The residence overlooks a mountain lake with expansive mountain views beyond. The design ties the home to its surroundings and enhances the ability to experience both home and nature together. The entry level serves as the primary living space and is situated into three groupings; the Great Room, the Guest Suite and the Master Suite. A glass connector links the Master Suite, providing privacy and the opportunity for terrace and garden areas. Won a 2013 AIANC Design Award. Featured in the Austrian magazine, More Than Design. Featured in Carolina Home and Garden, Summer 2015.